The opening lines of Dicken’s immortal A Tale of Two Cities remind me of the “messaging and spin” received from the two candidates for the upcoming presidential election. As we all know, Hermes was the messenger God of Greek mythology, later renamed Mercury by the Romans. Adaptive and cunning, Hermes moved swiftly between the world of man and the world of gods, acting as a messenger and link between mortals and Olympians. If we substitute “Washington politics” for “the world of gods”, then Hillary Clinton and Donald Trump’s Mercury may well be serving the same function―delivering messages from on high to mortals (voters) below. But what a difference in the messengers! The contrast between the two Mercurys could not be starker, the one being as loose as a leaf in the wind, the other buttoned up tighter than Fort Knox. In the remainder of this essay, we will explore the Mercury function in Trump and Clinton’s birth charts. Each Mercury plays the role of messenger, explaining to the American populace the values and intentions of the candidate it represents. Mercury’s sign position answers two fundamental questions: how and what. It tell us how the message will be delivered, and it discloses something of what the message will be. The house position of Mercury reveals where the message originates and the circumstances toward which it is predominantly directed, and its aspects suggest the influences to which Mercury will be subjected via its relations with other planetary functions. Trump’s Mercury resides in Cancer in the 11th squaring Neptune in Libra in the 2nd. To understand the Donald’s Mercury, we have to take into account other chart factors, especially planets Mercury disposes. With his Sun and Uranus in Gemini, there is an enormous amount of mental energy channeled to Mercury. Picture a gas powered pressure washer funneling information down a tube with tremendous intensity to Mercury. But Mercury’s nozzle is in Cancer, which restricts and spreads the outflow, rendering it more like a high pressured spray than a sharp, incisive stream. Trump’s Mercury in Cancer speaks in a way that is more impressionistic than factual. An impressionistic style is based on subjective reactions presented unsystematically, and may entail memories, moods, and images that spontaneously come to mind. This is certainly characteristic of Cancer, which perceives emotionally through sympathetic rapport rather than intellectually through words that correspond to concrete data. Imagine yourself observing a carnival from its center. There are sounds and smells, screams and laughter, a rush of movement with dazzling lights and people of all ages mingling together in a festive, joyous swirl. So many senses are involved, so many impressions formed simultaneously, that the final mix is more of a gut sense than an empirical analysis. If asked to describe the carnival, you might say: “Wow, it was an amazing experience. This is a great, great carnival, with rides and lots of other things, too. Really, incredible. Maybe the best carnival ever. And I mean that, folks. Believe me.” That’s Cancer. If it feels good, it is good. If Mercury were in Gemini, all those impressions would be sorted out and classified into a clear description. The view is more objective, preferably from the periphery of the carnival. The carnival now becomes an assortment of several different types of rides, some favored more than others, with a strong smell of cotton candy in the air, and one girl in particular who is throwing up after being on the roller coaster, which looks rather old. “This is a medium sized carnival that originated in Chicago,” you might observe, “with 7 different rides featuring an excellent carousel, 22 booths including a Balloon and Darts game, five proprietors that offer junk food, and the people seem moderately happy. As a carnival, it’s fairly average.” Factual, specific, clear; that’s Gemini. As mentioned, Trump’s Sun-Uranus in Gemini gets funneled to Mercury in Cancer. Cancer is the mouthpiece that filters his words and gives them an emotional tone. When Trump speaks, it’s more suggestive of information than clearly articulated facts and data. There’s a wink and nod, a shrugging of shoulders, a sudden gesticulation with hands and a torrent of folksy words conveying feelings and impressions. For most people, there’s enough information to follow, but you get a feel for the man’s attitude more than a clear understanding of a plan he’s going to implement. That’s ultimately what Trump is communicating―an attitude, a state of mind that says, “I can return this country to the glory of yesteryear.” Trump loves to speak in superlatives. “We’re going to build a great, great wall…I’ll be the best job’s president God ever created…the people of Arizona are fantastic people…our politicians are completely incompetent…Hillary is the worst Secretary of State this country ever had.” Superlatives are an evaluative response―great, best, fantastic, completely, worst―that communicate whether something (or someone) feels good or bad. Again, these are not facts, they are feelings. It is worth noting that Trump also has Saturn conjunct Venus in Cancer. His over the top Mars in Leo Ascendant bombast, and his garrulous gaffe-a-minute Gemini-Sagittarius opposition get most of the attention. So it’s easy to miss the importance of Cancer. Yet, with three planets in Cancer in the 11th this is the main theme of the Trump revolution. The 11th house is where we join with others of like mind for a common cause. The pro-Trump movement is decidedly Cancerian. It’s about wanting to reverse America’s decline, tighten our borders, and restore our national identity as one big family―a family that transcends the racial divisiveness that accentuates differences rather than reconciling them. With Mercury Cancer in the 11th, his thinking is tied in to the collective, sensing their feelings, needs, and wants. In his acceptance speech for the republican nomination, Trump trumpeted, “I am your voice!” He declares that he’s a messenger of the people, a spokesperson for a movement to “take our country back and make American great again.” Note the Cancerian emphasis on precedents, foundations, roots. We’re going back to what works so we can be great again. Cancer is populist, patriotic fervor and longing for a past where people felt connected in a country with clear borders and strong family ties. That’s what Trump is talking about. Mercury Cancer in the 11th answers the question of what he thinks and where it originates. He talks about the homeland (Cancer) because he intuits that taking American back is the people’s cause (11th). Whereas Cancer honors the past, the 11th house concerns the future and what we are evolving toward. “We need to put America first and get back to the future,” says Mercury Cancer in the 11th. The final piece of the puzzle is Mercury’s closing square to Neptune. Whereas Cancer is an impressionistic, subtle, suggestive, indirect, and emotionally evocative style of speech, its square to Neptune gives it a wobbly, fuzzy quality, as if he is just making things up as he goes along, playing fast and loose with the facts. This is due to the nature of Neptune, which symbolizes the collective unconscious. Neptune is the repository of dreams, fantasies, and ideals that have no boundary precisely because they reside in an intangible, transcendent sphere accessible only by the imagination. When Trump makes a policy statement, he is not making a promise, but conveying an aspiration. The danger with Mercury-Neptune is that facts and imaginings get mixed up together, resulting in a tendency toward wishful thinking―or, if one is not careful, outright denial of what is factually true. A closing square is a Capricorn angle that requires the planets work together for the sake of a joint goal, but the challenge is always control. Given that Neptune’s nature is to surrender, let go, and give in, control is especially difficult. Neptune is the antithesis of control; it is a dissolving of boundaries, a melting into a liquid state of flow. If Mercury is unable to control Neptune’s input, Trump’s thinking is apt to be flooded with images, intuitions, and extraneous information that has no obvious relationship to the topic at hand. Imagine trying to sort mail into proper trays in an anti-gravity chamber; everything is floating about and nothing stays put. Trump’s speech is sometimes like that. He has a tendency to go off on tangents with loosely associated thoughts pulling him in different directions. A funny example of Trump’s tangential thinking is his comments on the Iran nuclear deal during a campaign rally in South Carolina on July 21, 2015. A simple translation would be: “I believe the Iran Deal is bad for the United States,” but the structure of his thought falls apart because he cannot control the inflow of memories and associations that overwhelm his syntax. The result is a muddled word salad, a stream of consciousness, unedited, digressive, fragmented, like a dream that unfolds chaotically; yet, the meaning embedded within the tangle of words, innuendos and reminiscences somehow seeps through. While this is clearly an extreme example of Trump’s speaking style, it illustrates the challenge of Mercury square Neptune. It is also worth considering that when he is speaking at a political rally it is off the cuff and not necessarily the way he thinks through problems that require clear analysis and practical solutions. In a business environment, his thinking might still be largely intuitive (Neptune), but he obviously gets the job done. His success in construction and real estate is clear testimony to that. Perhaps when speaking extemporaneously in front of large crowds he is more anxious than we realize. I suspect Trump prefers dialogue with another person because the other serves as an anchor. If you observe Trump being interviewed, he’s focused and coherent, even charming. But left to his own devices, he goes off the rails pretty quickly. To whatever extent Trump’s Mercury-Neptune square can be utilized effectively, it is likely to have positive effects in the 2nd house. This is where we accumulate and secure holdings, as in wealth creation. Neptune here suggests his sense of possibility vis-à-vis prosperity is as infinite as his imagination allows. “I like thinking big,” Trump says, “If you’re going to be thinking anything, you might as well think big.” Neptune symbolizes the infinite and eternal, the One, the Absolute; it’s hard to think bigger than that. Trump reminds me of the Kevin Costner character in the 1989 film Field of Dreams. Costner hears a voice in his head, “If you build it, they will come.” Trump did build it, 17 Trump Towers spread all over the world, and they did come: more than $74 million in real estate licensing deals and $823.3 million worth of real estate in joint ventures. To some degree at least, that speaks for itself. Neptune’s location also symbolizes where a person is likely to feel a sense of compassion and a desire to relieve suffering. When Trump talks about the poor, about people who lost their jobs because their companies relocated outside the U.S. to employ cheap labor, about the lack of jobs in inner cities for economically impoverished black Americans, this is Mercury square Neptune in the 2nd talking. However much one might disagree with his tone or strategy, Trump says he wants to save jobs, renegotiate better trade deals, get the economy moving again, lift people out of poverty, and elevate prosperity for everyone. In the most positive sense, this reflects the aspect at hand. There is little reason to doubt his sincerity. Given Trump’s extraordinary wealth and extensive business holdings, it is certainly not in his economic self-interest to spend the next four to eight years helping other people become wealthy. Yet, questions remain as to whether he has the competence and experience to do what he says. In every conceivable way except, perhaps, her tendency toward prevarication, Hillary Clinton’s Mercury is different than Donald Trumps. Whereas Trump puts his foot in his mouth on an almost daily basis, Hillary is so tightlipped it’s questionable she can get a straw in there. Infamous for not liking questions she cannot prepare for in advance, Clinton has avoided doing any press conferences for nine months, unprecedented during a presidential campaign. Hillary’s reticence is not surprising in light of her Mercury in Scorpio conjunct the Ascendant, just outside the 1st house. While its closeness to the Ascendant might suggest spontaneity in her willingness to speak her mind, its tenancy of Scorpio and exact square to Saturn (within 5’ of arc) indicates otherwise. This is a Mercury with all the spontaneity and transparency of a bomb shelter. Keenly aware of the human propensity for evil, Scorpio is notorious for its vigilance, guardedness, and general suspicion. Hillary has her Sun, Venus, and Ascendant in Scorpio as well. That’s a lot of backup for any inclination Mercury might have to anticipate that others will be less than trustworthy. Mercury in Scorpio tends to think in ways that are penetrating. It probes beneath the surface for information that is hidden. Concealed Information is concealed because it is associated with power and vulnerability. For example, if a foreign national wanted an illicit favor from Hillary as Secretary of State, she might subtly suggest he make a financial contribution to her private Foundation via a Canadian front group set up to shield the donors’ identity, as was reported in the New York Times. The ultimate goal of Scorpio is to facilitate transformation by integrating disparate elements into a functional whole. In the helping professions this constitutes healing, but in the political-financial world it entails making connections and putting together deals that are mutually empowering. Often, however, there is substantial risk involved. Given the stakes, secrecy is warranted. What we do to survive is one of the meanings associated with 1st house factors. With Mercury in Scorpio on the Ascendant, Hillary may instinctively feel that knowledge is power and must be zealously guarded for the sake of her own survival. The square to Saturn seems to underscore a need for information control. If integrated, Mercury square Saturn would correlate to a serious, disciplined approach to learning, combining knowledge with authority so that over time the person rises to a position of distinction in a particular field of knowledge. Saturn’s placement in the 9th suggests mastery of the legal justice system. As a graduate of Yale Law School, this is precisely what Hillary achieved. And given that Scorpio pertains to the world of corporate finance, she was appointed the first female chair of the Legal Services Corporation in 1978, and has subsequently served on multiple corporate boards, the most recent being the Clinton Foundation―a philanthropic organization dedicated to various causes throughout the world. If there is a message to the populace in all this, it’s that Hillary signifies the status quo, and that she will use her power and connections to assure that the downtrodden, persecuted, and disempowered are protected by the legal justice system. Of course, this means appointing liberal Judges to the Supreme Court that further assure Obama’s plan to “fundamentally transform America” will continue unabated. The show must go on. But there’s a dark side to Hillary’s Mercury that suggests the country will be subject to endless intrigues and allegations of corruption if she is elected, for such has followed Hillary for virtually her entire professional career. This seems to reflect, at least in part, an ongoing struggle between Mercury and its exact square to Saturn. If I were to offer a generic interpretation of an unintegrated Mercury square Saturn, I would say the native is apt to feel that her knowledge is insufficient to achieve professional goals. She might overcompensate for perceived deficiencies, while struggling to keep at bay expected criticism from superiors. Mercury’s sign position of Scorpio adds a furtive, sneaky dimension to the mix. Imagine a 5th grader with a cheat sheet as she enters the classroom for an important test. She is anxious to succeed, but worried she’ll fail. She eyes the teacher warily, anticipating she could be under suspicion. Saturn corresponds to delays, obstructions, and barriers. In hard aspect to Mercury this can indicate not only frustration in obtaining required knowledge, but also stonewalling, as in delaying tactics and other attempts to stall or refuse to release information. The opening square is a Cancer aspect requiring containment; that is, holding in awareness contradictory planetary impulses so that their expression is sensitively attuned to the situation. Given that Hillary’s Mercury Scorpio makes an opening square to Saturn, there is no better expression of the configuration than Hillary’s private server in the basement of her own home―a black box containing top secret information over which she endeavors to maintain complete control. Hillary Clinton’s campaign is in many respects a machine. It relentlessly raises money, methodically runs the ground game and ceaselessly moves her from venue to venue, each event indistinguishable from the next…when it comes to messaging, the campaign and its principal operate with crafty prevarication. This is an excellent description of Mercury Scorpio on the Ascendant square Saturn Leo in the 9th. Rove employs two metaphors, like a machine (Saturn-like machinations), and runs the ground game, a football reference conveying a grinding, relentless, no frills attack, which is consistent with Mercury on the Ascendant (assert, compete) square Saturn (grinding, relentless). And when Rove says her messaging operates with “crafty prevarication,” we know he’s seeing Scorpio. Any astrologer familiar with Mrs. Clinton can see her Mercury Scorpio square Saturn―the cagey, controlled style, the practiced delivery, the memorized speech, the disciplined stay-on-message professional politician. Hillary is often criticized as “inauthentic” because there’s such a glaring absence of spontaneity (precisely the opposite of Trump). When Clinton answers questions during interviews, her speech is measured and cautious, as if engaged in a chess match with a formidable opponent. She will smile and deploy colloquial speech patterns every few sentences to make it seem that she’s just regular folk who drops a “g” like the rest of us. “Well let me say this, Chuck, I’m just doin’ my best to get the word out.” But if asked a question that is too pointed, she is apt to throw her head back in a sudden spastic eruption of bone-chilling cackle, as if the question is just too ridiculous to be taken seriously. Of course, the subtext of her laughter is that she knows the question is incriminating and could expose something she does not want the questioner (or the people) to know. Her laughter is a reaction formation, compensating for the anger she harbors toward her interrogator. Pure Scorpio. The joke going around D.C. is that Hillary personifies the old Washington adage: “I prefer to tell the truth, it’s easier to memorize.” Her 11 hour testimony before the House Select Committee on Benghazi was textbook: evasive, mendacious, grinding, but highly effective in reciting the information she wished to convey. With Mercury conjunct Venus in Scorpio, she’s taken her natural diplomatic skills and turned mendacity into an art form. No one does it better. A recent CNN poll found that 68% of respondents said Clinton is not honest or trustworthy. Yet, she’s ahead of Trump in all the polls. This alone is testament to her mastery (Saturn) of messaging (Mercury). The 9th house pertains to travel and foreign affairs in general. Saturn in the 9th would certainly be consistent with Hillary’s position as a former Secretary of State. She engaged in constant communications (Mercury) with foreign governments, heads of state, diplomats, dignitaries, and ambassadors, often around Scorpio matters pertaining to crises like Benghazi, as well as complex financial entanglements that governments have with one another. Another meaning of the 9th is philanthropy. A charitable organization like the Clinton Foundation depends on funds raised from donors, which implicates Scorpio (finance) again, as well as Mercury’s dispositor, Pluto, which along with Mars is conjunct Saturn. With all three 9th house planets squaring Mercury in Scorpio, the entire configuration looks like an aggressive fund raising machine that entails a plethora of politically sensitive communications with foreign donors. It also looks like an array of powerful adversaries bearing down on what she knows with the intent to expose her secrets and lies, or so they charge. In this latter regard, her Mercury looks like a castle under siege. For example, there is growing controversy over Hillary’s ties to the Clinton Foundation during her tenure within the Obama administration from 2009-2013. Evidence suggests that foreign and domestic corporations “sought to influence her decisions as secretary of state by making donations to the Clinton Foundation.” Recent email disclosures make clear that Clinton’s aides granted certain individuals special access to Hillary because they were Clinton Foundation donors. 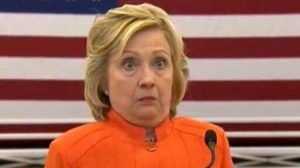 More ominously, Clinton deleted over 30,000 emails from her private server after being informed that her records had been subpoenaed by Congress. Under penalty of perjury on August 8, 2015, Clinton swore before a U.S. District Court that the deleted emails merely pertained to family and friends, and that she had turned over all work-related emails to the State Department. Yet, last week the FBI recovered nearly 15,000 additional emails from her private server, “thousands” of which, according to FBI director James Comey, were work related and include evidence of coordination between the Clinton Foundation and the State Department. It now appears that her true reason for having a private server was to conceal such coordination. Suspicions are swirling about that Hillary was selling her influence as Secretary of State. Further, “It seems like the Clinton Foundation operates as a slush fund for the Clintons,” said Bill Allison, a senior fellow at the Sunlight Foundation, a government watchdog group. With regard to the thousands of emails that were not recoverable, Clinton’s “lawyers cleaned their devices in such a way as to preclude complete forensic recovery,” said FBI Director Comey. Apparently, Hillary’s team utilized a highly expensive technology called “BleachBit” that, according to the BleachBit website, “allows users to shred files to hide their contents and prevent data recovery.” This goes far beyond merely deleting emails. Yet, Comey later said at a press conference, “We found no evidence that any of the additional work-related e-mails were intentionally deleted in an effort to conceal them.” Of course, if Clinton was intent to conceal them, it follows she would leave no evidence by which she could be indicted. Lack of evidence that a crime was committed is not evidence that a crime was not committed. I did not email any classified material to anyone on my email. There is no classified materials. I am confident that I never sent nor received any information that was classified at the time. I had not sent classified material nor received anything marked classified. Wallace pointed out that FBI Director Comey testified before Congress that none of those things she told the American public were true, even if there was not sufficient evidence to charge that she intentionally committed a crime. Recently released transcripts of her FBI interview, during which she was accompanied by four of her lawyers, reveal that she used the standard non-self-incriminating “I don’t recall” 40 times in response to even the most simple questions, such as “did you receive training for how to identify classified information?” Every lawyer knows that “I don’t recall” is code for signaling to the interviewer that no information will be forthcoming on that topic. Moreover, when asked to produce the 8 blackberries and 5 iPads on which she conducted government business, Clinton’s lawyers admitted they were either lost or had been destroyed with a hammer. On September 6 (today), based on new details revealed by the FBI this past Friday, there has been a request for an investigation into whether Mrs. Clinton is guilty of obstruction of justice and destruction of evidence pertinent to a congressional investigation. New information is being released on an almost daily basis and no one knows where it will lead. This has got to feel like a nightmare without end for Hillary. It has been said that the truth fears no questions. Hillary’s FBI stonewalling and avoidance of the media (nine months since her last press conference) may not be attributable merely to Mercury in Scorpio. If Saturn signifies obstructions, its placement in the 9th and exact square to Mercury perfectly reflects the “obstruction of justice” of which Hillary is being accused. And “destroyed evidence” is an eerily fitting meaning of Mercury in Scorpio. A fascinating thing about birthcharts is that the same configuration that describes a psychological conflict also signifies an external predicament. In this regard, it would appear that Hillary’s Mercury not only anticipates that her survival depends on her capacity to conceal what she knows, it likewise describes the actual situation in which she finds herself: the subject of State Department investigations and FBI probes into her private server wherein all her communications are stored that pertain to her tenure as Secretary of State. Saturn-Pluto-Mars is an array of powerful others from the 9th house legal justice system intent on uncovering what she knows. Her Mercury in Scorpio is, in fact, under siege. Hillary’s backers are hoping she can survive until November 8. But if she does, it is questionable whether it will be to the country’s benefit. If there is a voice in Hillary’s head, it’s not likely one of divine inspiration (as in Field of Dreams), but merely the faint and distant echo of a guilty conscience. Hayes, Stephen. “Aiding and Abedin: The Clinton family favor factory,” in The Weekly Standard, September 5, 2016, p. 11. HRC’s birth time is uncertain. Therefore, your house interpretations of her chart may need revision. Regardless, nice archetypal contrasts of Mercury in Cancer vs Scorpio. However, relative to other politicians, the high prevarication index that you ascribe to HRC is not supported by the facts. Trump’s average Pinocchio rating was 3.4, breaking Rep. Michele Bachmann’s previous worst Pinocchio average of 3.08 in 2012. Clinton, on the other hand, ended up with an average Pinocchio rating of 2.2, putting her in the same range as President Obama and former Massachusetts governor Mitt Romney. Another incisive piece to enjoy and contemplate upon! What I appreciated the most is the emphasis on the importance of ability to tell apart the message from the messanger. I think this is relevant for each situation but perhaps even more so when citizens delegate powers on their ‘elected representatives’ to make decisions and act on their behalf. The contrasting of the two different thinking and communication styles, through brilliantly elaborated astrological interpretation of the relevant factors in their birthcharts, demonstrates the value of astrology as a tool facilitating us to glance below the surface. It brings about greater awareness and transparency that could be valuable contribution to our own ‘filtering’ process when receiving political messages. I believe we tend to sympathize to different styles when it comes to messangers, but what should ultimately matter is the message, which hopefully we are able to hear loud and clear. Glenn Perry, for me you constantly excell yourself: in terms of clarity and depth of insights, brilliance of interpretations, thought provoking revelations and new subject areas for astrological exploration! Thank you Your analysis of both mindsets is very helpful. Mercury has achieved maximum elongation and begun retrograde motion (speed, 0°07′) at the time of Hillary’s 8:02 am birth. This to explain the “S” beside the Mercury glyph in the Perry published chart. By 8 pm Mercury had picked up a little speed and was moving at 0°11′ longitude. It is a retrograde Mercury. Trump’s Mercury is scooting away from the Sun in direct motion at a very fast speed of 1°52′. These factors also contribute to how Mercury functions in the charts. Sluggishly slow for Clinton reflects the extreme caution of her Mercury function while Mr. Verbal’s mouth can get way ahead of his thinking and reasoning functions. This is an interesting bit of additional information, though I don’t know how one could differentiate what you say is causal from more conventional factors impacting Mercury in Trump and Hillary’s charts. For example, Trump has Sun conjunct Uranus in Gemini opposed Moon in Sag, so obviously, as you say, Trump talks quickly and jumps to conclusions and so forth, all typical of Sun-Gemini opposed Moon-Sag. It will be very interesting to see who the American people choose for their next president. Whose Mercury character will be the mind, heart and voice of the people for the next 4 or more years? You have surely given us some excellent details to contemplate. Thank you, Glenn. As always, wonderful analysis and psychological depth of understanding.. I enjoyed your usually clear and informative analysis of each! Nicely balanced presentation too. Hillary has The Dark Moon Lilith conjunct her progressed Sun and Mercury both Square Neptune …Nothing good could come from that! Great impressions/descriptions of our political candidates styles!